After the release of the IPCC Working Group I report in September there has been a lot of attention to the issue of the GHG emissions budget that corresponds to staying below the internationally agreed global mean temperature increase of not more than 2°C. Unfortunately, the numbers being discussed are a bit confusing, since they mix “carbon” ,”carbon dioxide” and “ CO2equivalent” (i.e. all greenhouse gas together) and do often not account for the errata that IPCC issued in November regarding its Summary for Policy Makers of the recent Working Group I report. To go from C to CO2, numbers have to be multiplied by 3.67. Compare the budget of about 1000 GtCO2 with current annual CO2 emissions (about 34 GtCO2 from energy and industry and about 5 from deforestation and land use change): at current rates the budget will be finished in about 25 years. Compare the budget with the currently known fossil fuel reserves: about 3/4 of those reserves will have to stay in the ground (see graph below from the Scientist Statement). 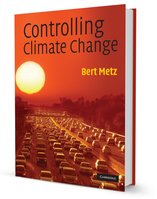 Bert Metz, climate scientist, served as UN IPCC Mitigation co-chair for TAR & AR4. He is an adviser with the European Climate Foundation, and visiting professor at CEU Budapest. Get in touch through Twitter.